When we started this quinquenium – nearly 5 years ago, so our time is nearly up – ++Rowan asked us as a Synod to put energy into listening to one another. In my cynicism, I thought this an impossibility. We knew where each other stood on the two main issues (sexuality and gender) and to listen properly meant being open to change. How could that be? But at this group of sessions it happened. The debate on ACNA should have been a conservative/liberal point scoring. ACNA broke away from TEC, and someone on Synod wanted us to be in communion with them (whatever that means). But the debate was marked by its honest listening. A gracious debate and generous motion was finally passed, and we glowed warmly. Then it happened again the next day. In law civil partners do not receive the same backdated pension rights as married surviving partners of a priest, although government and several larger companies have shown compassion and give back dated pensions. Synod was being asked to show the same generosity. And they did. Despite cynical laughter at the beginning of the debate when someone said this was not a debate on the morality of gay marriage, Synod started to listen, and then voted to be generous. People on Synod made sacrifices this week in not give way to the forces that bind us into our theological cliques. 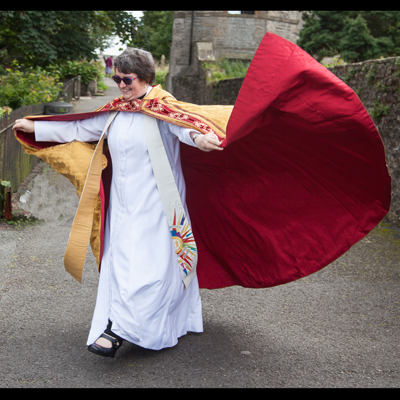 It bodes well for the summer when we look at women bishops. So exciting to see how the quality of relationships with one another we have made over the last 5 years can transform how we listen. Thank you for that insight! It is useful for us “rural pew and pulpit fodder” to know what is happening “up there”, and that is a most encouraging change.